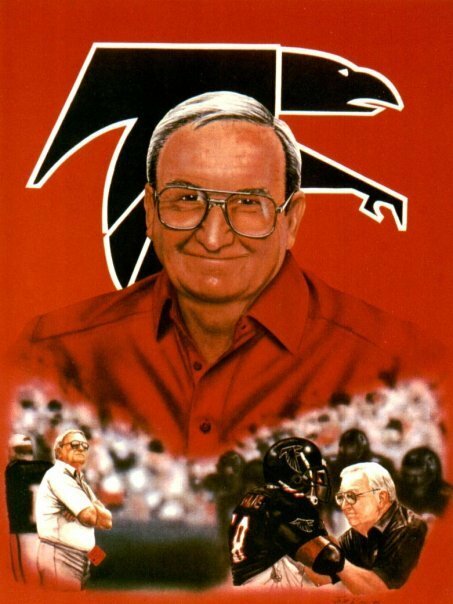 Whitey Zimmerman was the Atlanta Falcons Equipment Manager from 1966 to 1994, when he passed away due to a sudden heart attack. Zimmerman came to the Atlanta Falcons in 1966 after spending four years with the St. Louis Cardinals football team as equipment manager. He set up the Falcons for their first practice in the summer of 1966. He also set up the team’s practice facility at Suwanee and designed the locker room at the Georgia Dome. His start in professional sports was as a batboy for the St. Louis Browns. In 35 years in the NFL, he worked nearly 600 games, including preseason, regular season, and postseason. The Falcons wore the initials “WZ” on their helmets for the San Diego gamed played three days after his death. He was a veteran of the United States Navy and the St. Louis Police Department. When he died, he was considered the dean of NFL equipment managers. Their annual award is named “The Whitey Zimmerman Equipment Manager of the Year” in his honor. He is also honored with National Football Foundation scholarships to Georgia High School Scholar-Student Managers and Athletic Equipment Managers Association Scholarships to college Student Managers given annually in his name.